Just like that its summer. I woke up yesterday morning with a vague sense of dread. It’s summer. Don’t get me wrong I love summer, but what in the bleep am I going to do with The Associate. I momentarily dream of a camp that starts as soon as school ends and goes until the first day of school. I don’t really want this but a girl can dream. The loss of my days is a blow especially because I spent a lot of the last days of freedom stupidly spring cleaning instead of making stuff. This morning I awoke to The Associate screaming “I want to go for a run!!! !,” and just like that its summer. me- Are we morning people now? A little background is necessary. This Associate of mine is a night owl, some nights she is still playing as we go to sleep at MIDNIGHT! In the good morning (that’s what she used to call the morning) for school I wake her up at least 4 times, eventually dressing her as she lies limp. So, now to clarify, she is a morning person just in time for summer break, which means I am a morning person now. yay. Bleary eyed I make my coffee and find a perch on the porch to watch my newly hatched marathon runner. me- No, you can’t have ice cream for breakfast. 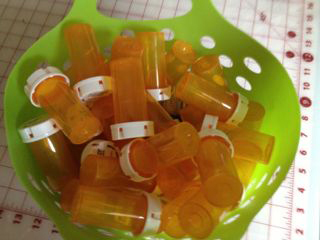 I quickly run down all the available containers and settle on the abundant supply of prescription bottles that I collect. As we travel around our yard I am surprised at how many things we can learn from this adventure. I briefly forgive myself for the terror I felt earlier, pour myself another cup of coffee and move on. Great to see you too! let’s get our bleeps together!